DAMASCUS, SYRIA (1:00 A.M.) – A long-standing Islamist bulge threatening the provincial capital of Hama has officially been liquidated by the Syrian Arab Army (SAA) as government forces assembled overwhelming firepower and thousands of troops to dislodge jihadist factions led by Hay’at Tahrir Al-Sham (HTS). Following a blitz offensive through the Islamist stronghold of Halfaya on Sunday, the SAA swept through a handful of rebel-held villages and simultaneously advanced along the M5 highway, moving ever closer to Morek, believed to be the next target of commander-in-chief Suheil Al-Hassan. 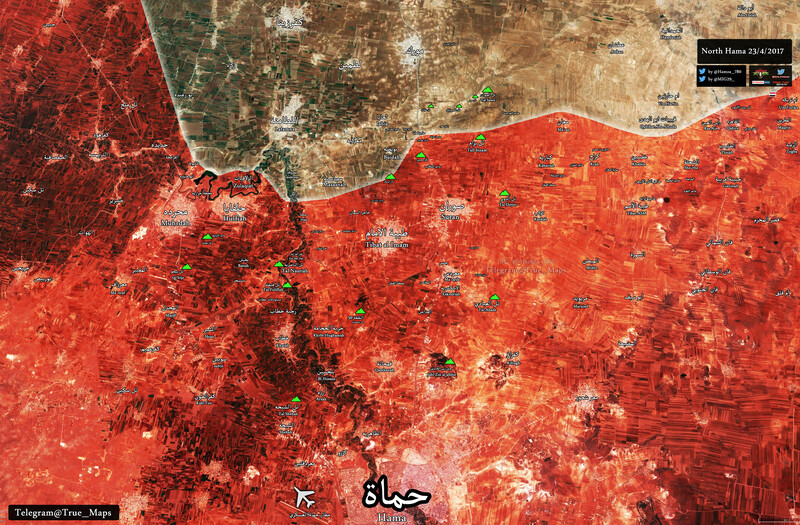 Since reaching points three kilometers from Hama city weeks ago, rebels have been pushed back along a wide frontier to positions 18 kilometers from the provincial capital. With all jihadist counter-offensives foiled, HTS and allied Islamist factions must now set up a defensive line along the Lataminah-Morek axis if they are to avoid government troops unleashing huge numbers upon the Idlib governorate, considered to be rebel heartland. With concentric SAA offensives underway from Latakia and Aleppo, jihadist factions based in Idlib seem to be lacking sufficient manpower to defend all their frontlines in what could prove to be the initial step of their inevitable demise. An HD map can be found here. they should focus on that. there was a jihadist raid there last night. Eleminating the Idlib province would cut the Turkish supply line from the rebels. Whether this is actually feasible or not in a short time frame is anyone guess. The pocket north of Homs is largely contained and rebels there don’t seem to want to do anything that would attract a large government assault.